Celebrity kids are internet’s favourite and their snaps go instantly viral on social media. 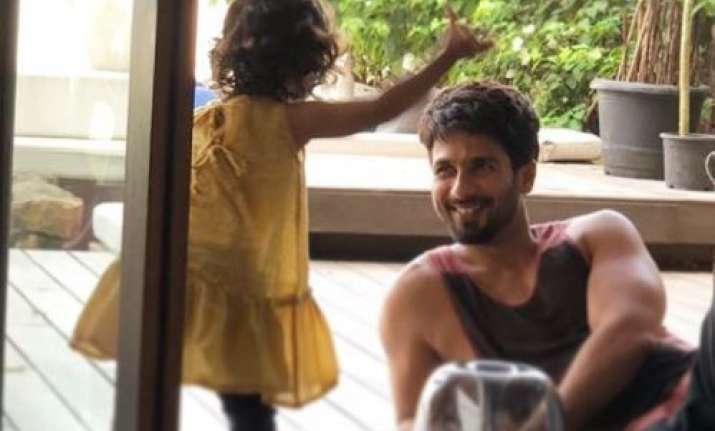 Shahid Kapoor’s daughter Misha is one such star. The doting father keeps on sharing lovely pictures of his munchkin and we just can’t have enough of it. Recently, the Padmaavat actor shared a cute snap of himself along with Misha and it is making us go aww. In the picture, we can see Shahid lying down on the floor and laughing at Misha’s antics, while the little girl is trying to tell something to her dad. Shahid captioned the picture, ”When you know. Nothing else matters”. Few days back, there were reports that Mira Rajput may be pregnant, however, there has been no official confirmation yet. Recently, Shahid who won GQ Style Awards said that when Misha will grow as old as Alia Bhatt and she will tell him to dress well, he will show her the trophy. The actor said that he will also tell Misha that she can’t tell him anything before she gets one of these. On the work front, Shahid’s last film Padmaavat got rave reviews from critics and was loved by audience. It set cash registers ringing by minting over Rs 300 crore. The actor is currently shooting for Shree Narayan Singh’s Baati Gul Meter Chalu in Uttarakhand. He took some time off to spend quality time with his family in Mumbai. The film which is based on electricity theft in small towns also stars Shraddha Kapoor and Yami Gautam. It is slated to hit theatres on August 31.